Okay, so I'm back from Los Angeles. The wedding went well. It was a very pleasant trip for me. I was able to visit my younger brother and his family and also my good buddy Leon and his family. 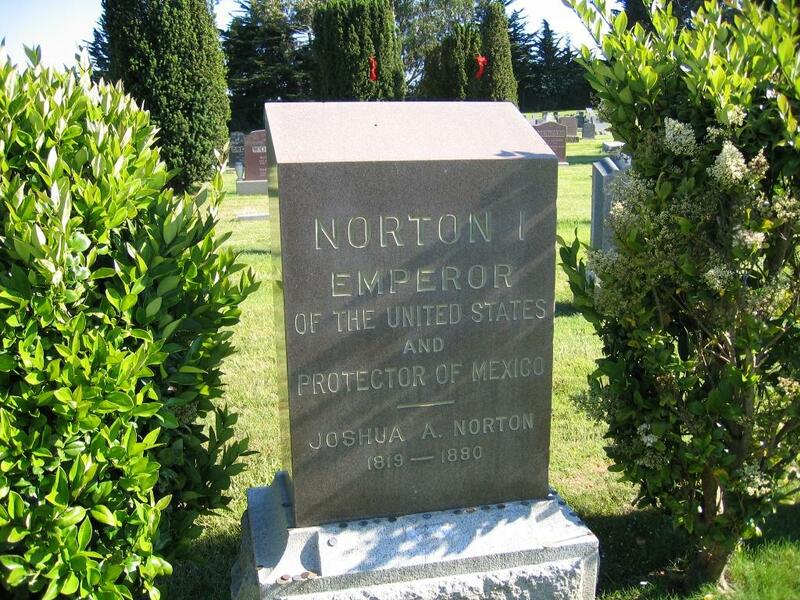 Congratulations to DAG who correctly identified our last Person-of-Mystery as Joshua Norton, Emperor of the United States and Protector of Mexico! 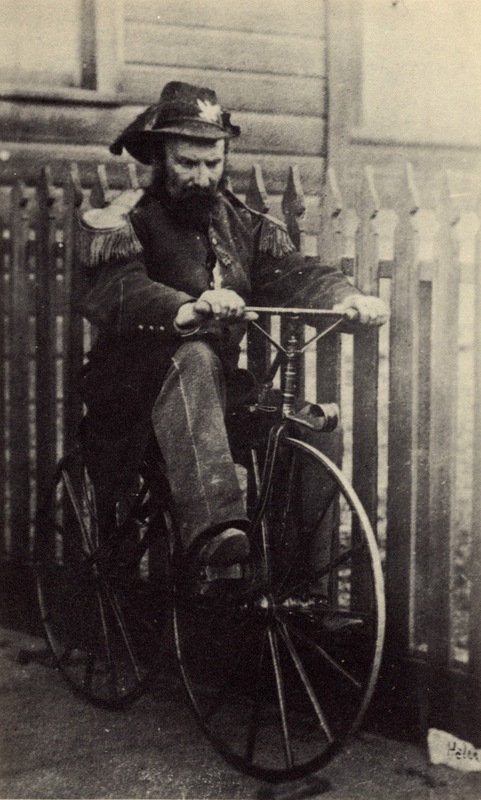 Josh Norton was definitely one of the more unique characters to come out of San Francisco's past. Basically, he was an eccentric man who lost a fortune when he invested in the rice market and it tanked. He took to proclaiming himself Emperor of the United States and would write local newspapers and issue proclamations, the first of which he sent in 1859. Newspapermen would publish Norton's decrees and in short order he became an eccentric celebrity. He dressed in military garb and walked around with sword in tow. 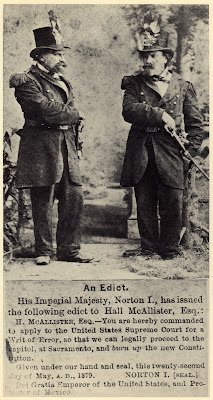 Often he was associated with two stray dogs, Bummer and Lazarus, although Norton disliked the association between him and the two canines. 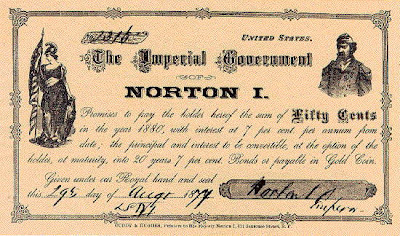 Norton would at times review the local police, check on city works projects, and was vigilant in seeing local ordinances enforced. He also printed his own currency in denominations of 50 cents, five and ten dollar denominations and would pay for his meals at local restaurants using his own currency. Being a local celebrity, most businesses took his currency and gave him free meals. Some of his best known proclamations include: proclaiming himself Emperor of the United States, abolishing the US Congress and both political parties, demanding royal attire be made for him and royal residences be built, dismissing Abraham Lincoln, declaring that Maximillian of Mexico surrender and be sent to the US or refusing to do so be shot, supporting air travel, called for a bridge be built from San Francisco to Oakland, banned the use of the term "Frisco" when referencing San Francisco, demanded a royal allotment of the Central Pacific Railroad profits, called establishment of one true Christian religion, and announced his intention to marry (many assumed the widowed Queen Victoria). There were many other edicts and as his fame increased there were numerous false decrees written by others. 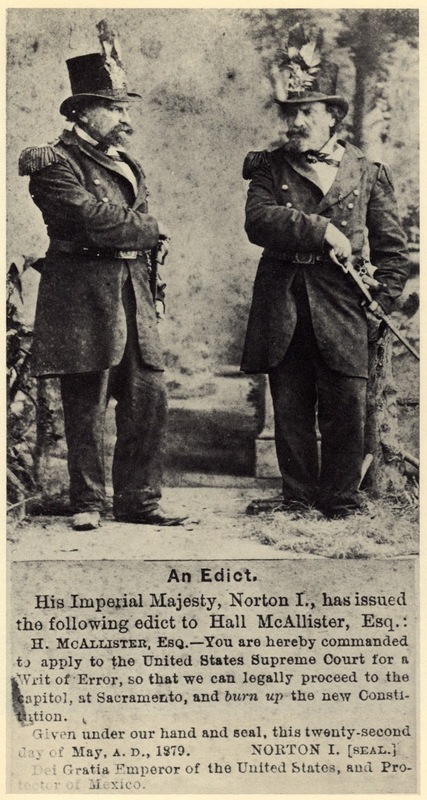 Emperor Norton died in January of 1880. It is said that 30,000 people attended his funeral and the cortege was two miles in length. WOW. what a character. Now days he would have been commit to an asylum so fast. Would have made a great Tea Party candidate.